Whether you're dealing with a poor credit history, saving for your first home or simply wanting to feel more secure for yourself and your family, learning how to manage your finances well is important. Getting your finances in order isn't about denying yourself of all the nice things in life. It’s about making sure that when financial issues appear, you'll be better prepared to deal with them and that when opportunities arise, you can afford to take part. Read on for wisdom from the Money Guru about managing your finances. There are many ways to look at budgeting. In its simplest form, budgeting involves making sure your outgoings never exceed your incomings. At the same time, adding savings into your budget will help guarantee a more settled future. Here are some of the simplest ways to budget your money. 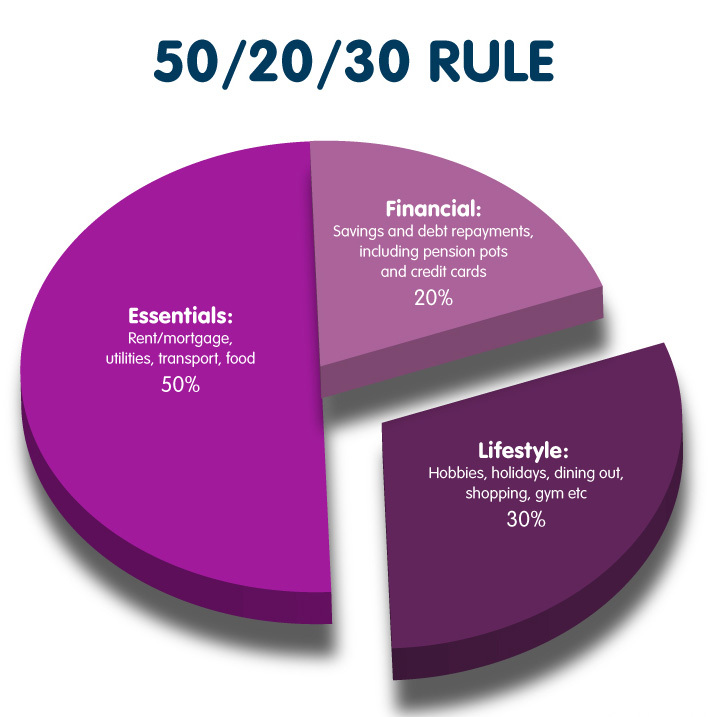 The 50-20-30 rule, advises that you spend 50% on essentials, such as the rent or mortgage, energy bills and other living costs, 20% on savings and debt repayments and 30% on fun, lifestyle things. These are not necessities, but things you want. The beauty of the 50-20-30 rule is that it can be applied to any income. It's also a good idea to split your savings into more than one pot – a short-term and a long-term saving fund for example. The long-term fund should include saving into a pension pot and money as a safety net, say if you were to be out of work or you needed repairs to your home. This savings pot could help you avoid the need for a loan in the future. The short-term savings are to pay for things like holidays, big birthdays, Christmas and other special treats so that you don't have to lose touch with your budget when busy times and pleasant opportunities come your way. Whenever you get paid, sit down with a stack of envelopes and think about the times you will need to spend before your next payday. Put into the envelopes the amount of money you are willing to spend on each category. These envelopes will cover the obvious, like bills and debt repayment. But you should also be strict about the envelopes for socialising, paying for groceries and allowing yourself a treat. Physically taking out money can stop us from overspending as a card purchase doesn’t register in the brain in the same way. Handing over actual cash makes us think about the value of the item we are purchasing in more detail. It also stops you from making larger purchases because you’re unlikely to be carrying that much money around. It's also a good idea to save any leftover change in a money box and when it's full, put this money into a savings account. (Many banks now offer a save the change option too, where any card purchases are rounded up to the nearest pound and that money is put into a savings account). The 30-day rule works by making you wait before you make a purchase, so it’s great if you have trouble with impulse buying. It is designed to make you stop and think before making a non-essential purchase and is particularly useful for those who buy things only to find them unused a few months later. To apply the 30-day rule, simply take a note of the things you want to buy. You can carry a small notebook for this or even use the notes on your phone. Whenever you see something you would like to buy, write the name of the item, the store and its cost as well as the date. If, thirty days later you still have the urge to buy the item, then you can. Normally though, this technique will stop the purchase long enough for the impulse to fade away. It’s especially useful for trend-led buying where you may be influenced by clever social media marketing. When faced with a large amount of debt, saving money or even having a consistent budget can feel like a losing battle. Here the Money Guru advises you on two of the most popular techniques for reducing and paying off multiple debts. This way of repaying isn't necessarily the cheapest, but for those who are struggling under the pressure of paying off debt, it can give a real boost as it means paying off one debt quickly and then gaining momentum as more debts are paid off. To begin, list all of the debts you owe. List them by order of amount owed and then write next to them the minimum amount due. You now need to commit to paying off at least the minimum payments. You will then add an extra amount to the lowest amount owed. This means that amount will be paid off first. Once that first amount is paid off, you'll add that monthly repayment allowance to the next smallest amount you owe and continue this way until you are debt free. The debt avalanche method is a way of paying off debt by paying as little interest as possible, by paying off the debt with the highest interest first. If you have several debts with different lenders, start by listing those debts in order of rate of interest. You will make the minimum payment on each debt. The extra cash you have once these minimum payments have been made, can then be used to make a payment on the debt at the top of your list – the one with the highest interest. When that top of the list debt is paid off you will add the monthly allowance to the next debt in line – the one with the second largest interest rate. You will continue in this way until all your debts are gone. Whichever way you choose, it is best to write these out and plan within your budget the amount you need to pay off each month. This way you will feel more committed to paying off your debts and are more likely to succeed. Sometimes debt is inevitable. And remember, not all debt is bad. For example, having a credit history is essential when you want to borrow larger sums such as getting a mortgage. The emergency fund should be enough to cover the cost of car or house repairs or the equivalent of two to three months wages in case you were to become unexpectedly unemployed. The rainy-day fund should cover the cost of holidays and big birthdays so that these don't affect your monthly budget. No amount of wishing will solve your debt problems. Once you have drafted a budget and committed to debt repayments and savings, make sure to stick to those plans. If it means taking note of every purchase or using the 30-day plan, do it. It's only by being consistent and sticking to these plans that they will work. If you do come across a time when you need a loan, use our moneymatcher to find the one that’s right for you and don't be afraid to speak to your bank. They will be able to advise on the right type of debt for your situation and may even have free financial services available to you.